I put this off until today. I had the day off but KR is down so what is a knitter to do?? 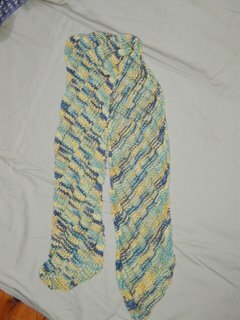 Even if no one visits this blog, it should be a nice way for me to keep track of my progress/failures/success stories when it comes to knitting. 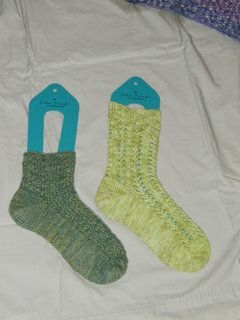 First, I totally forgot to send Lin (aka Busyhands) a picture of the socks made from her yarn. Since we're on the topic of socks, here's Nautilus (pattern by Anna Bell) made out of Nature's Palette in mallard and Hedera (pattern on Knitty by Cookie A.) made out of Sweetgeorgia superwash. 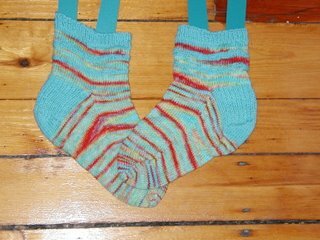 There's actually a pair of each (I knit both socks at once using the Magic Loop). "What's that purple thing lurking in the back? ", you ask. 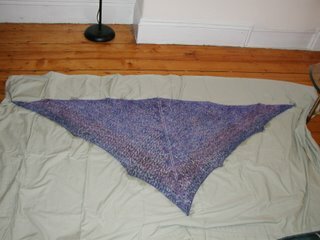 It's my latest FO, the Charlotte's Web shawl made out of Koigu (no, the shawl is not sweating, I'm a low-tech blocker!). 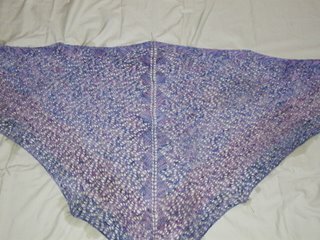 This is a good first lace project since you start with 7 stitches and increase every other round. No never-ending cast on! However, the pattern is misleading when it talks about "mirror image" so you should be careful to have the decreases slanting in the right direction. I also promised my friend mangokiwi two pictures. 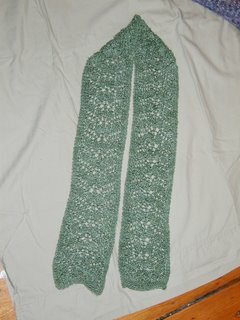 The first one is the wonderful Branching out scarf she knitted for me out of Fiesta La Luz. She knits socks and lace among other things, can you believe she's been knitting for less than a year?? That's about it for today, I will add links on the sidebar and scare everyone by taking a picture of all my sock yarn another day! Hurray! Welcome to the blog world Minh! All your stuff is beautiful... I am going to link to you. Welcome to the blogging world, Minh! Gotta love the knitblogs!! I didn't know what to do without KR for a few hours. Your FOs look great!! Yay--Minh cracked! Welcome to the blogiverse, er yarniversal blogging system, er . . .